My ‘Botanicals’ series will be on view at Brand New Orleans Art Gallery from July 12th- Aug 20th with an encore reception on White Linen Night August 4th 6-9 p.m. This collection of paintings was my reflection on the New Orleans landscape. Each features different views of the region’s subtropical ecology and urban landscape, including the Mississippi River and surrounding swamplands. My design process dissects elements of the surrounding landscape and collages them back together. I layered each feature atop the previous, cropping and obscuring what came before. This emulates the natural and artificial processes of change in landscape over time. 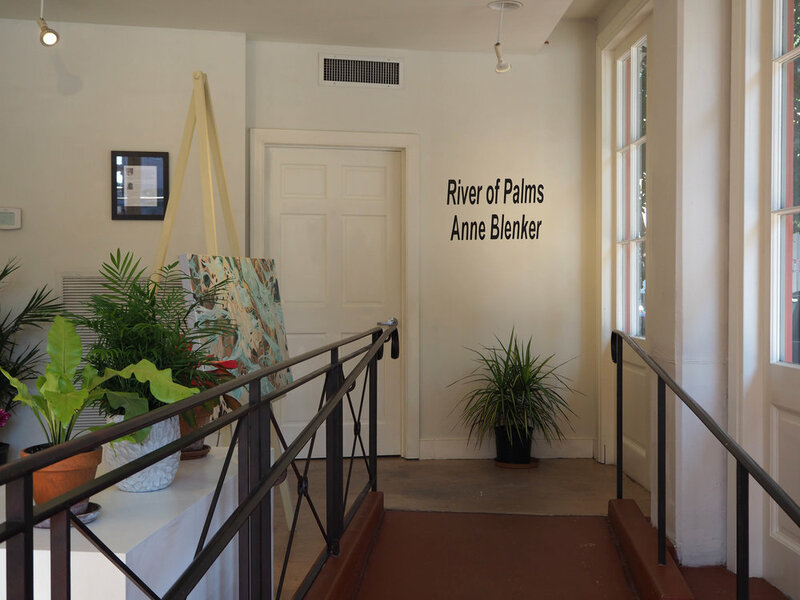 The river plays a main character in the historic drama and in these paintings, creating and destroying ecosystems on its path to the gulf and centering our trade economy. It is the most important geographic feature in the region and the lifeblood of the people here. By collaging together these native elements of Southern Louisiana I celebrate the beauty of living with these natural features and consider how our modifications to natural systems, including levees, navigation canals, and drained wetlands will portend for the region’s health in the long run. I was led to this series by my sustained interest in topography and systems – natural systems, man-made systems, and the relationship between the two. In my previous work, I digitally collaged shapes, textures and color of aerial topography from around the world and then layered them one by one reflecting on the process of transformation. In the newer series, I wanted to pull more specifically from the landscape of this region and introduced mixed perspectives that are more psychological than aerial, incorporating plants, topographical, and features that make New Orleans unique.